April 01, 2013 at 11:35 am. The passing of Alabama athletic director Mal Moore last Saturday was a real blow not only to the University of Alabama but to the world of college athletics as a whole. He represented the University with class and dignity whenever he was at a collegiate athletic function. Like those old E.F. Hutton commercials, when Mal spoke people listened. He had the respect of athletic officials across the country, and people admired the way Moore ran the Alabama athletic department. That had nothing to do with the national championships, which is what people think of when they hear the words “Crimson Tide”. And why not? Moore was a part of 10 national championships at Alabama as a player, assistant coach and athletic director. I don’t know for sure, but my guess is that no other person in athletics has been so involved with so many national titles. The first one came backing up Pat Trammell at quarterback on Bear Bryant’s first national championship team in 1961. The next two came in 1964 and ’65 when he was on Bryant’s staff first a graduate assistant and then as defensive backfield coach. The next three came when he was a quarterback coach in 1973 and 1978 and ’79. He picked up another national championship ring in 1992 on Gene Stallings’ staff. 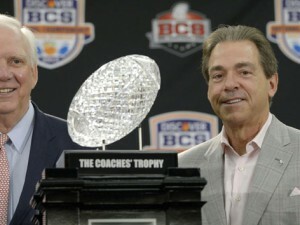 And the final three came as AD after Nick Saban brought home three BCS championships. While serving as athletic director for the past 14 years, Alabama has not only garnered three football championships, but it has also won national titles in gymnastics, softball and women’s golf — along with multiple SEC titles. It’s hard to pinpoint exactly what will be remembered as Mal Moore’s greatest achievement. Certainly the excellence Alabama teams have enjoyed on the playing fields has to be one of them. Luring Nick Saban to coach the Crimson Tide when so many doubted that he would be able to do it certainly has to be Moore’s greatest hiring. But looking around the Alabama athletic facilities, you see Mal’s influence. During his tenure as athletic director, he spearheaded the facilities upgrade by raising over $240 million dollars in a time of final hardship across the nation. Moore was a man who wore a number of hats. At one time considered Bear Bryant’s right-hand man, a fund-raiser, and the man who hired Saban, Moore wore all those hats with pride. He also coached at Montana State, Notre Dame and the NFL’s Phoenix Cardinals, but Moore loved the University of Alabama unfailingly. And the University of Alabama returned the love. The University proved that on March 28, 2007, when the Board of Trustees renamed the Football Building the Mal M. Moore Athletic Facility. As offensive coordinator under Bryant, Moore was criticized at times for what was considered a conservative and often dull approach to offense. Moore heard the criticisms but never wavered in his approach, mainly because he was doing what his head coach wanted him to do. And don’t forget, Alabama was winning under Moore’s offensive tutelage. It did, however, occasionally fall short. One such day was Nov. 1, 1980 when Alabama traveled to Jackson, Mississippi to face Mississippi State. The Crimson Tide was coming off consecutive national championships and had a 28-game winning streak alive. But Mississippi State’s defense shut down the powerful Wishbone offense. Alabama was averaging over 300 yards on the ground but could only muster 116 that day. Late in the game with State holding a 6-3 lead and Alabama trying to mount a rally, Moore was on the sideline trying to figure out just how to crank up the Tide running game. At one point, Bryant sidled up to Moore to make a subtle point. “Mal, do you think we are going to throw the (bleeping) ball any time today?” Bryant said. “I got the point,” Moore said. He had Tide quarterback Don Jacobs take to the air. Jacobs led the Tide to the Mississippi State 4-yard line with 25 seconds remaining. But the Tide quarterback was hit in the backfield by MSU’s Tyrone Keys and fumbled the football. It was recovered by State’s Billy Jackson and the Bulldogs’ had a 6-3 win. Alabama fell out of the top spot in the polls, and it would be the last time a Bryant-coached team was ranked No. 1. But it would not be the final time Moore was associated with a No. 1-ranked team. He would be associated with football national championships four more times, with the final one coming this past January when Alabama downed Notre Dame. Mal Moore passed away last Saturday morning at the age of 73, but his influence will be felt around the Capstone forever. Thanks for the memories Coach Moore.